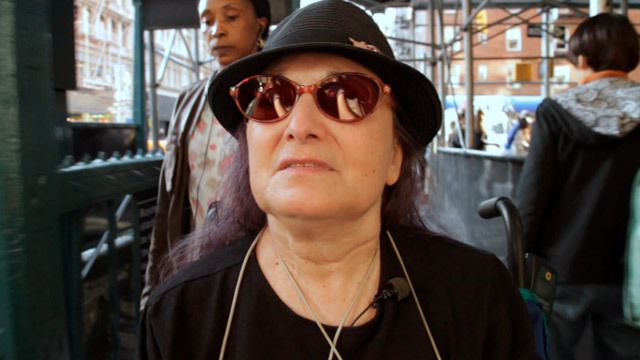 (NSFW) Despite blindness, multiple sclerosis, and lung cancer, photographer Flo Fox continues to shoot the streets of New York City. Ever since the popularization of DSLRs, short profile documentaries have become ubiquitous online. So, in order for us to feature one—in order for a film to rise above the veritable flood of content—the subject has to be pretty damn special. Well, fortunately, director Riley Hooper has found such a person in Flo Fox—a photographer who can no longer see, wheelchair bound and crippled by disease. But, Flo isn’t some sob-story—a tearful reminder of a once vibrant persona withering away in despair. No, that wouldn’t much do for Flo at all. As you get to know her over the film’s brief nine minutes, her unique personality comes through. She’s a firecracker—sharp, full of wit, and buttressed by a dirty sense of humor. She roams the streets of New York City searching for interesting subjects, capturing moments with gusto. Undeterred by her inability to hold a camera anymore, she instructs her aides to take pictures for her. With each snapshot, Flo seems to be rallying back against all the negativity in this world—a subtle, simple victory for wonderfully dogmatic persistence in the face of opposition. Watch out world! Flo is still on the move! I’ve often said that the key to a great documentary has much less to do with the film’s craft and far more to do with the subject itself. And, while I’ll stand by that statement, director Hooper does more than just slap Flo in a generic interview setup covered with bland b-roll. Rather, we’re on the ground with her— rambling through Manhattan as hunters searching for artistic prey. The approach is as brilliant as it is low budget. Riley Hooper secured her tripod to Flo’s wheelchair using bungee cords, walking backwards down 23rd street as she captured the shot and simultaneously tried not to bump into anyone. The DIY feel gives the film a very special, lo-fi aesthetic. Hooper, who is currently the content and community manger at Vimeo, shot, directed, edited, and produced Flo entirely by herself. The film toured festivals across the country sweeping up a few best of accolades along the way. Though, Hooper isn’t one to rest on her laurels (pun intended). She just finished a new short doc about the world’s longest yard sale, entitled Elvis Loses His Excess & Other Tales From The World’s Longest Yard Sale. Primed for its festival run, you can check out the trailer here. Follow her on twitter and visit her personal website to keep up with the latest news and screening information. Finally, be sure to check out Flo Fox’s personal website to see more of Flo’s excellent, witty street photography.